Ten years ago, we used litmus paper to show that Dove’s pH neutral formula was the preferable route to clean skin. Sales exploded. 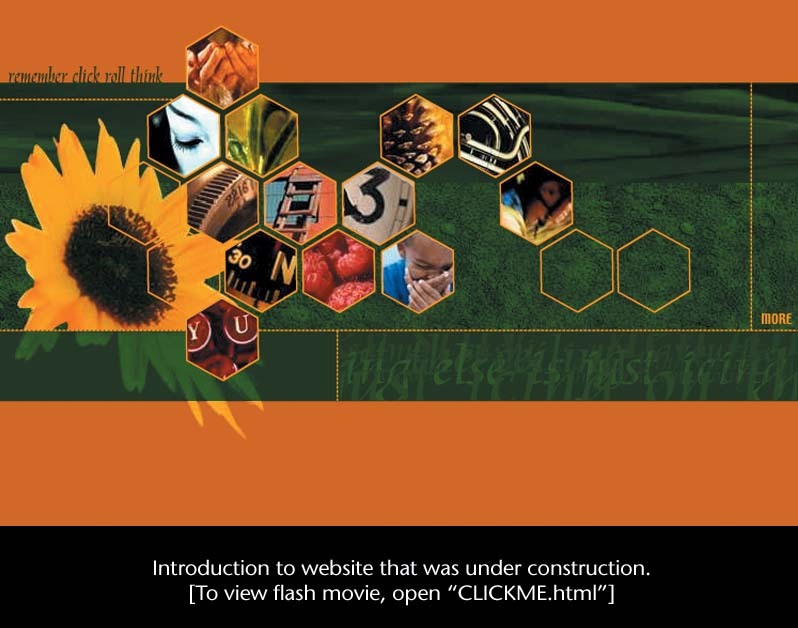 In 2001, we wanted to get the demo in front of Canadians again, but in a fresh way. Key to maximum impact was getting consumers to do the test themselves. So, we created interactive magazine ads, direct response and in-store demos. The TV ad showed the test results in a graphic, visual context. Music played a powerful role, as did outstanding editing - making what could have been dry, arresting. Since the campaign broke, Dove’s share has hit an astonishing 35%. The new work is now running in several countries. We were truly surprised that Zellers’ new merchandise could be had for so little and we wanted moms to know it. Maintaining a tongue-in-cheek tone, "How do they do it?" became the theme around which all radio and TV was created. In television, things like jeans, raincoats and shoes became symbols to represent the surprisingly superior level of style for so little at Zellers. In radio, it became a powerful traffic - and sales - generator, wrapped up in an entertaining variety-show send-up. The patio furniture launch was so successful that the spot had to be taken off the air early. Girls’ back-to-school denim had double-digit sales increases and raincoats and running shoes flew off the shelves. 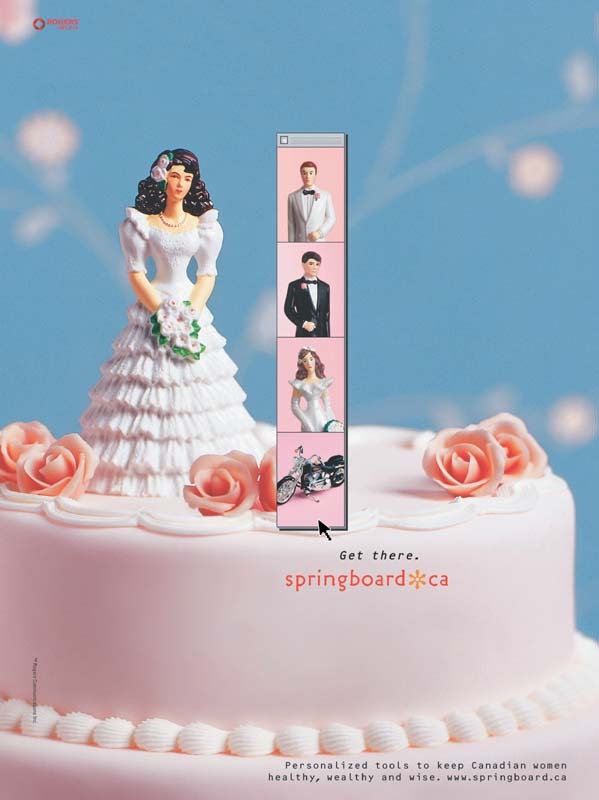 Springboard.ca was a site created by women for women, offering personalized tools like fitness programs, financial planning and relationship advice. We used women to speak to women and chose to confront issues in a pointed, witty way that gets straight to the heart of the matter. Our cost-efficient media included print, radio and Internet. When the female clients in the room saw the work, they literally laughed till they cried. There was strong industry support for the site in the form of advertising sales. Unfortunately, before the business was truly up and running, Springboard.ca fell victim to cutbacks in the high-tech sector. Our strategy was to change the feelings of the lapsed user (a closet KFC lover) from shame ("it’s too greasy, it’s unhealthy, it’s dated") to pride. Research showed there’s a gold mine of good feelings about KFC lurking deep inside even the most infrequent purchaser. The answer: Use stories that appeal on a sensory level - evoking the way it smells, feels, tastes - in an entertaining, contemporary context to get a Pavlovian "I’ve got to have it now" response. We kicked off the campaign with a baby licking his fingers to get us back into thinking about "finger lickin’ good." The spots that follow feature people obsessed with the brand. The creative framework is life as usual disrupted by a surprising turn of events. Strong performances are key, and a fresh way to show the food imperative. Thus, we liberated the storytelling from the "bite and smile" cliché. 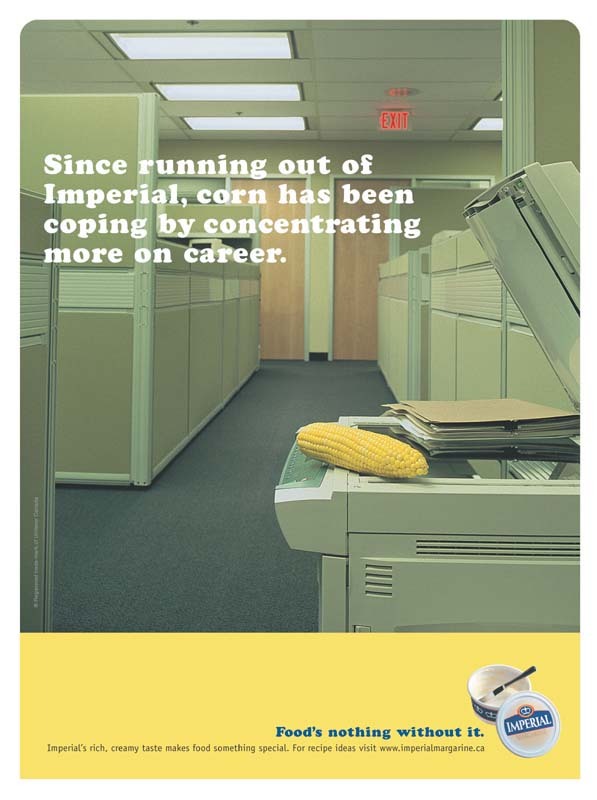 In the "Food’s nothing without it" campaign, we communicate that food tastes better with Imperial by showing the tragic consequences of life without it. Thus far we’ve run two spots: "Spud" and "Love in the Express Lane." One is a Romeo and Juliet-like tale of loss, the other a goofy romance film. Music played a critical part in each story, using famous, sappy love songs from the ’70s and ’80s. 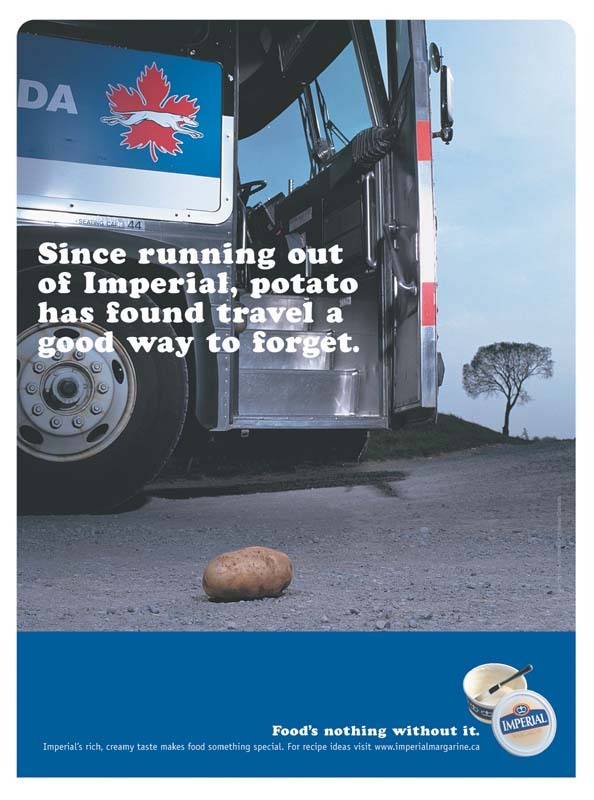 The accompanying print reinforces the notion with tragicomic tales of how heartbroken vegetables are getting on with their empty, Imperial-free lives.